NEWPORT BEACH — As the top youth sailors from around the world battled it out July 17-22 off Newport Beach for top honors in the Governor’s Cup Match Racing Championship, young and old sailors alike were treated to a special appearance of the America’s Cup Trophy at Balboa Yacht Club. 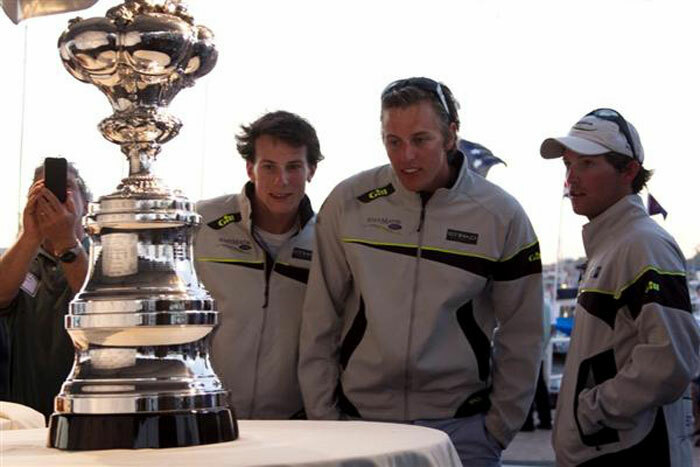 The sterling silver trophy, the most sought-after prize in the sailing world, is currently in the hands of the 33rd America’s Cup winner Oracle Racing and San Francisco-based Golden Gate Yacht Club. “I give a lot of talks, but I rarely take the cup along with me,” said Tom Ehman, executive director for the 34th America’s Cup, coming to San Francisco Bay in 2013. Ehman gave a “Cupdate” to more than 300 youth sailors and Balboa YC members July 22, detailing plans for the next America’s Cup competition, and future plans for youth sailing in America’s Cup racing. Now involved in his 11th America’s Cup, Ehman over the years has been a team member, an event organizer and an event director for both winning and losing sides. He has been a member of Larry Ellison’s Oracle Racing team for the past three events. The five-day event — now in its 45th year — pits 12 youth sailing teams from around the world against each other in identical 21-foot boats designed by Balboa YC member Alan Andrews, creating an even playing field that brings sailing skill to the forefront. Young and old sailors got the chance to take their picture with the shimmering trophy, and were also treated to guest appearances from Oracle Racing skipper Jimmy Spithill and 2010 Rolex Yachtsman of the Year Stan Honey — both Governor’s Cup alumni. During the presentation, Ehman outlined plans for the 2013 Youth America’s Cup sailing race. Currently, sailing teams entered in the 34th America’s Cup event are racing on 45-foot catamarans called AC45s in a warm-up to next year’s main event, which will feature 72-foot winged-sail catamarans on San Francisco Bay. After announcing a new partner in energy drink company Red Bull, Ehman talked about the formation of a Youth America’s Cup competition, in which younger sailors would compete on the AC45s currently being used by the top sailors in the world. Planned for Sept. 1-6 next year, the Red Bull Youth America’s Cup is set to be open to up to 10 national teams of six sailors, ages 19 to 23, and one representative from the United States — in addition to the Golden Gate YC team. “I think with the ages of sailors involved in this event, Balboa Yacht Club should get involved, and get a team in the race,” Bajurin said. While the America’s Cup appearance made a big splash at Balboa YC, the racing on the water did not disappoint. Governor’s Cup organizers said they saw some of the most competitive sailing since the race’s inception at this year’s event. With two full days of racing completed, 10 of the 12 teams entered were tied for second place, one win behind the leader. In the end, Royal Port Nicholson Yacht Club of New Zealand came out on top, winning six races in a row over the final two days to move from seventh to first place, finishing off fellow New Zealand team Royal New Zealand Yacht Squadron in the finals. The champion Royal Port Nicholson YC team included skipper Tim Coltman, middle Adam Middleton and bow James de Lisle. They dethroned San Diego YC, earning the required three wins in as many races in the semifinals. Another three straight wins came against Royal New Zealand Yacht Squadron, which had skipper David Hazard, middle Scott Barnes and bow Michael Boucher. San Diego YC, which won the Governor’s Cup last year, finished fourth.